Want to access your diagrams from anywhere in the world? Tired of drawing diagrams and sending them back and forth for reviews? Then Creately is just the thing for you. Founded in 2009 as a start-up it’s a diagramming tool that offers many unique features. It’s great for individual usage, but has some custom built features like real time collaboration to make it very attractive for groups and teams. Compared to software like Microsoft Visio it is very affordable and even has a free plan that supports up to five diagrams. Below are some features of the application. Because the diagrams are hosted in the web you can access them from anywhere in the world, as long as you have Internet access. Creately has a desktop application in case you need to draw diagrams offline. And every diagram you drew offline will be automatically synced with your online account when you connect with the Internet, Giving you greater flexibility and more accessible diagrams. 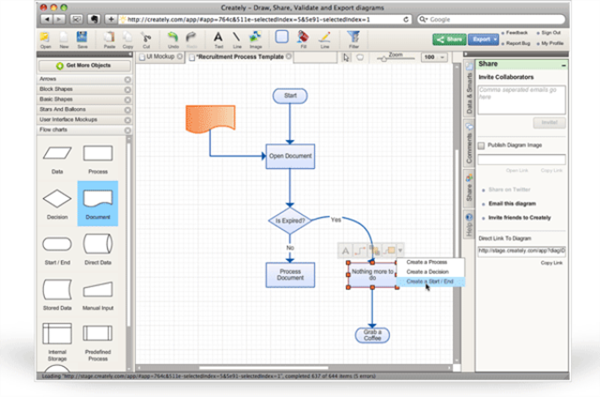 Compared to desktop applications like Microsoft Visio and OmniGraffle, Creately is much cheaper. The individual license is 5$ per month and you can cancel your subscription any time. There is a free plan that supports up to five diagrams and limited number of collaborators. This is great if you want to try out the tool before making an investment. Team plans are available at a discounted price. All paid plans come with unlimited number of objects and collaborators, a big improvement compared to other similar online solutions. Educational institutes get a 50% discount. Check out the plans and pricing. Creately supports all the major diagram types. They include Flowcharts, UML diagrams, Network diagrams, Organizational charts, Websites mock-ups, Wire-frames, Mind maps, business process models and many more. They even support simple Gantt charts which are extremely useful if you want to create a project plan with a simple drag and drop. All major diagrams have readymade templates so you can start creating diagrams very quickly. Don’t have the time to draw from scratch? No need to worry because there are thousands of diagram templates available to users. Not every one of them is great, but you can filter them out easily using the diagram explorer. This is especially useful when working with technical diagrams and when you’re stuck without a diagram idea. The online collaboration is what makes it really useful for teams and groups. Imagine designing a website for a client. You can create a mock-up and invite the client to work with you on the mock-up. He can draw things and give instant feedback so you can easily get a clear understanding of what the customer wants and you can do this from the comfort of your office. An excellent way to save time and impress customers. There are many features available to users the make drawing diagrams pleasant as possible. Extensive library to drag and drop objects, one click creation of connecting objects, integration with Google image search, multiple styling and the ability to create your own styles are some of the features available to users. Below video explains some of the features. Additionally they have lots of resources for you to learn about various diagrams. Check out the blog which has many articles covering all areas of diagramming. There are many sub sections covering each diagrams type, so if you’re interested in only one diagram type then you can focus on that too. Well it’s not all good with Creately. They are a Visio alternative so the ability to import Visio diagrams would be great. I know this is not a concern for most users who want a simple tool to draw diagrams, but for advanced users who want to ditch Visio and move to Creately this is a big barrier. Lack of a mobile application is another drawback if you frequently use your phone for your diagramming. I need some screen space when drawing diagrams so this hasn’t affected me yet. For Visio power users’ lack of diagram types can be a problem. They do cover most of the diagram types but floor plans, tree diagrams etc. are missing. A combination of all the factors mentioned above makes Creately a great low cost online diagramming solution. So what are you waiting for? Start drawing diagrams now with Creately. Nishadha Silva is an online strategist with a background in software engineering. Check out some of those strategies by visiting his digital marketing blog.